ISLAMABAD: Pakistani police launched a nation-wide crackdown overnight, arresting at least 1,500 supporters of cricketer-turned-politician Imran Khan ahead of an opposition rally planned later this week in Islamabad, officials said yesterday. The arrests followed intermittent clashes over the weekend between Khan’s supporters and riot police in the capital that saw police using tear gas and batons to fight stone-throwing activists. 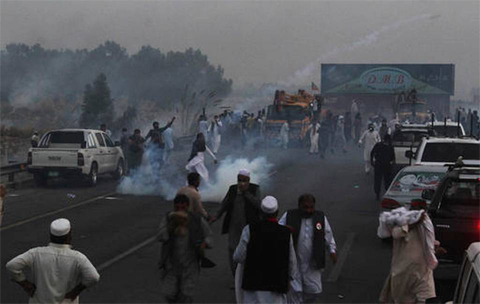 The violence erupted again Sunday near Khan’s suburban home and at several places on Islamabad’s outskirts. Yesterday, a Pakistani court barred Khan’s followers from demonstrating on Islamabad streets, restricting the rally to within the limits of a city park, said government prosecutor Saddique Awan. As of last week, the government has already enforced a two-month ban on street rallies in the capital. Khan’s attorney Babar Awan said the party would appeal. The party has called for massive street demonstrations for Wednesday, threatening to lock down Islamabad in a bid to force Prime Minister Nawaz Sharif to resign. Sharif has been under pressure after his family members were named as holders of offshore bank accounts in leaked financial documents from Panamanian law firm Mossack Fonseca. Police have conducted raids based on tips and information about planned violence, said government spokesman Zaeem Qadri. Those who pledge not to take part in violent actions are released, while those considered a threat remain in custody pending charges, he said. Two security officials, speaking on condition of anonymity because they were not authorized to talk to the media, said the number of those arrested overnight ranges between 1,500 and 1,800.